Professional development is an interesting concept. When most of us hear it, undoubtedly our minds go straight to an all-day conference with a keynote speaker, breakout sessions, and a hopefully free lunch. Hastily grabbing the official paper on the way out the door so you can log these hours into your licensure system, and ensuring you meet the requirement come license renewal time. I’ve attended quite a few of these conferences, and fortunately, a good majority of them have proven to be useful experiences. I know, however, that they aren’t always good. In my time as a teacher, I’ve also found that these learning days, while valuable, don’t always have the sustained effect that I would like. I’ll often walk out feeling energized, full of ideas, and renewed in my excitement for this beautiful profession. A few days later, we go back to school and I implement some new strategies, employ some new instructional methods, add a few new titles to my library. Often, I make a few changes to my practice that are for the better. But is one or two learning days really enough for educators to feel fulfilled? Is it really enough to sustain us, encourage us to employ new ideas in our practice, and support us as we do so? I’m gonna go with no. An article curating the qualities of effective professional development tells us that in order for professional development to take hold, educators need sustained contact hours, sometimes up to 20 (Garet, Porter, Desimone, Birman, & Yoon, 2001). Seems outlandish and impossible to devote that many hours to sitting in someone’s comfortably decorated classroom, reading the posters and bulletin boards that are getting more attention than they have all year. That’s because it is. Devoting that number of hours is unreasonable, and for most of our schedules, not even feasible. It’s time for educators and educational leaders to reconsider what professional development is and what it looks like. I don’t just mean restructuring our workshops and faculty meetings. I mean completely overhauling our conception of it. Because the way I see it, we are honing our skills as professional, licensed educators all the time, in a huge variety of ways. But before I start on what professional development is, I want to make a quick note of what it isn’t. Negativity has no place in the educator’s arsenal. It can often seem overwhelming when The Next Big Thing gets introduced and I get that, but approaching it with a closed mind is not the answer. Instead of shooting it down outright or justifying the ways you’re already doing it so you don’t need to change, ask questions and seek out more information. Because professional development is seeking out your own research. One of my favorite parts of grad school was the access to our online databases. Many of my courses didn’t have textbooks (my wallet thanks you), and instead encouraged us to seek out peer-reviewed journal articles instead. I was unsure at first, but as I became more comfortable navigating the robust resources available to me I was thrilled. There was so much information available to me, information that could truly influence my teaching and my kids, and all I had to do was go out and find it. It became commonplace for me to refer immediately to our library website when I was seeking out something new. Creating a new unit or a new resource, I’d consult a few research articles on best practice. Looking for behavior interventions for a few of my students, I’d run a quick search to find some ideas. Reading through these journal articles and case studies gave me real, research-based methods to incorporate into my day-to-day teaching. It was readily available when I needed it, tailored to exactly what I was trying to do. Sounds like a pretty personalized PD session that will actually transform teaching and benefit kids. And I didn’t even have to travel. At the end of the program, I was more worried about losing my access to ERIC online than I probably should’ve been. Thankfully, my husband enrolled in his own program shortly thereafter, so I can still get my research fix when I need it. And when that isn’t enough, I refer to my bookshelf. Because reading professional literature is PD. When a journal article isn’t quite enough, or better yet, when you’ve found an author you really like, professional literature is the natural extension. 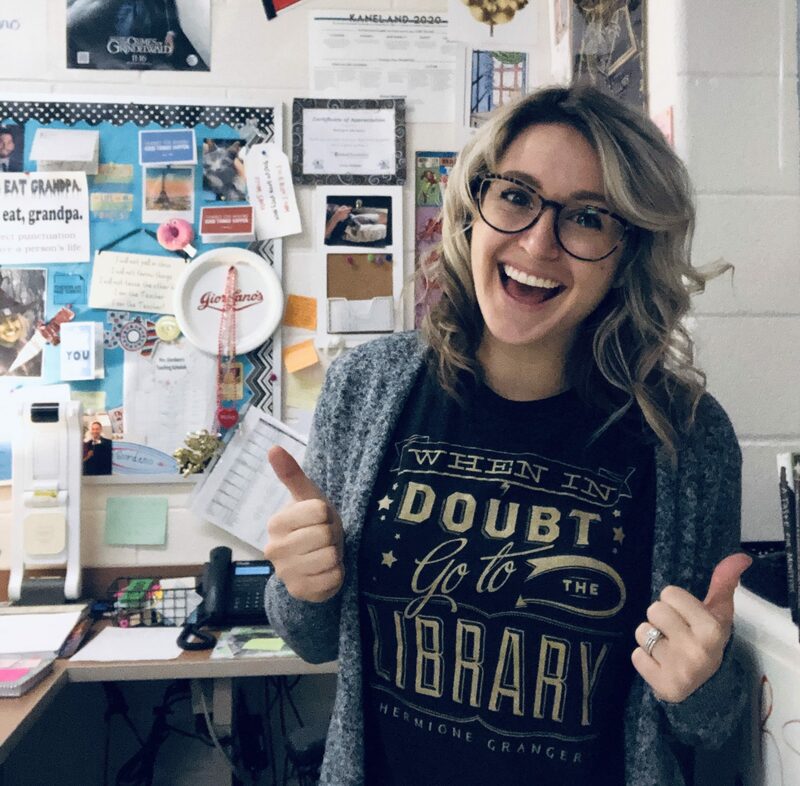 I’ve been lucky to connect with a few professional authors (mostly at #nErDCampMI… 2019 I’m coming! ), and I’m thankful I did. Between that experience and the influence of some of my colleagues, I’ve discovered how transformative some of this literature is. There are so many resources and suggestions shared in these books that can be used right away to benefit our students’ learning, that it seems like an obvious form of PD to me. When we engage in study, we often highlight, annotate, or mark pages with post-it notes with applications to our classrooms, or ways that the new ideas will fit in our practice. My copy of We Got This currently looks like a rainbow explosion of post-its, and I’m afraid to ever let someone borrow my Being the Change because all the margins are full of my notes. We refer back to it later, seeking out those hastily written notes, as we plan and adapt our lessons. This clearly demonstrates growing our practice, and improving our pedagogical and/or content knowledge to better our instruction for students. Another hallmark of professional development. This desire to read professional lit has been a reflective experience, too. Not only because many of the authors call for it, but because it’s left me considering my undergraduate experience and thinking… Man, I should’ve read the book. Blogging is a deeper form of reflection, and definitely a way to develop professionally. I could write a book about this. I’ve talked before about my #edublogger beginnings, written about how starting Curriculum Coffee has improved my teaching, and co-authored a column on blogging as a form of PD. It’s something I believe in because I’ve experienced firsthand the profound effect it’s had on me as an educator. Sitting down to write a piece, whether it be about my classroom or my philosophical beliefs, requires a deeper level of reflection than normal. Writing forces me to fully process a lesson I taught and consider why I did it that way. It brings my philosophy to the forefront and makes me think through the foundation for this belief. It’s even caused me to change my mind about stances I was adamantly in favor of. The notion that an audience will be looking at my piece encourages me to think more critically about what I do and what ideals I subscribe to. Without the platform of my blog, a lot of this reflection wouldn’t take place at the same level… or at all. Being a reflective educator is a deeply personal experience, but is a necessary part of developing professionally. Beyond just writing a piece, there’s the interaction. There’s a community involved when you start a blog, and it tends to have a positive influence on you as a professional. The audience isn’t just an unknown body of nothingness. When I write, I write to and for real people, and many of you engage in conversations with me based on what I’ve said. Some of my colleagues at school follow my writing and also chat with me, or challenge me, about what I put out there. And I love it. Because it engages us in professional conversation and collaboration. Which is yet another crucial aspect of PD—the learning community. Group interaction often lends support and stimulus to our development, especially when we try something new. We often need a second set of eyes, guidance from someone who’s tried it, or even just the knowledge that we’re not in it alone. When something goes well, it’s a huge source of encouragement to put it out there. When something completely flops, it’s comforting to know that there are still educators out there offering support. It’s vital to have this collaboration, and fortunately, blogging can be one source of it. I. Love. Twitter. I tell educators constantly that if they aren’t on Twitter, they are missing out on the greatest collective source of PD that exists. Because, honestly, that’s what #edutwitter is. Engaging in Twitter chats like #mgbookchat, #TWTblog, #g2great, #cleartheair, #masterychat, #nctechat, #AIMSnetwork, and way to many more to list—it’s powerful stuff. Connecting with educators around the globe and discussing ideas, books, practice, culture, disruption of social norms, available resources and MORE is an incredible way to become a better educator. It builds a community united around a common purpose and sense of responsibility, and is by far the best way to build a professional network. I have learned more than I could ever say from educators on Twitter. I’ve established and been able to maintain professional relationships with teachers all over the world. I have been offered new opportunities to engage in study and research through connections I’ve made on this platform. It’s real. And it’s full of generous, wickedly smart individuals who are dying to share their practice with you. Literally all the time. And you can do it in your pajamas. Definitely a win. It’s clear that there are an insane number of professional development opportunities out there. So many that I couldn’t possibly cover all of them in one post. Educators as a whole are a passionate bunch, devoted to the learning of our students. We are constantly bettering ourselves, looking for ways to do this important work to the best of our abilities. I firmly believe that the overwhelming majority of us seek out opportunities like these consistently, simply because we want to provide the absolute best education possible for our students. Every single time we do this, we are growing as professionals. Every single time, we are engaging in professional development. Even if the hours don’t count toward our license renewal. I love so many things about this post. The truths. The sources. And the fact that PD really is a “way of being” instead of an event that you embody in your post. But your closing is the absolute best. “Even if the hours don’t count toward our license renewal.” So true!